2284. John Bangs, born about 1560 in Norwich, Norfolk, England; died 11 February 1632 in Hempstead, Essex, England. He married 30 January 1586 in Panfield, Essex, England. 2285. Jane Chavis, born about 1565 in England; died about 1632 in Hempstead, Essex, England. * Edward Bangs, born before 28 October 1591 in Panfield, Essex, England; died 16 February 1677 in Eastham, Barnstable, Massachusetts, United States; married (1) Lydia Hicks (1612-before 1635) about 1633 in Plymouth, Massachusetts, United States; married (2) Rebecca Hobart (1611-1655) about 1635 in Plymouth, Plymouth, Massachusetts, United States. * Jonas Bangs, born about 1596 in Hempstead, Essex, England, died 1664 in Ingatestone, Essex, England; married Marie Chopin (1597-????) in Freyering, Essex, England. I have found no information about John Bangs and Jane Chavis, who died in England, other than their marriage date and children in FamilySearch Family Tree. * Robert Charles Anderson (editor), The Great Migration Begins, Volume I (Boston : NEHGS, 1995) pages 86-91, Edward Bangs sketch. * Dean Dudley, History and Genealogy of the Bangs Family (Montrose, Mass. : the author, 1896), pgs. 9 - 11, Edward Bangs sketch. I have done no original research for this Bangs or Chavis family. 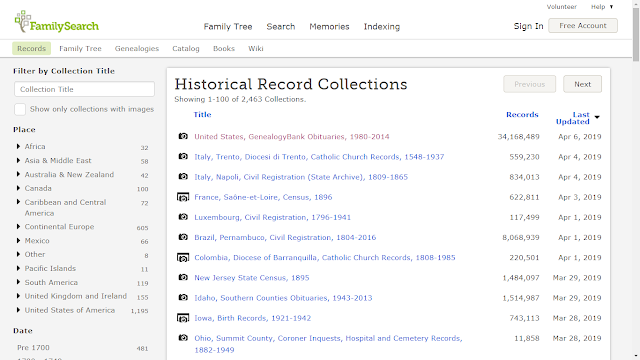 * April Update: GenealogyBank Just Added New Content from 71 Titles! * Fisher’s Top Tips Podcast: #59: What is an Occupation? * DearMYRTLE YouTube: Is it time to write your Memoir? 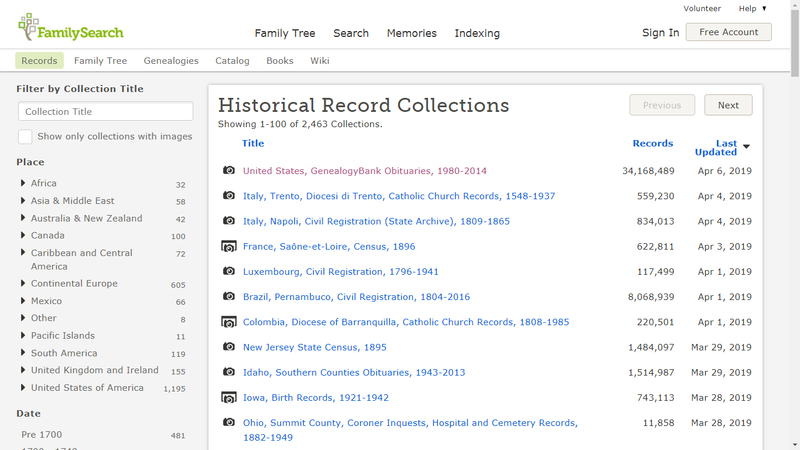 8) Did you miss the last Genealogy News Bytes - 2 April 2019? Leading family history website, Findmypast, has today announced the online publication of thousands of original Anglican parish registers in partnership with Kent County Council. The new records have been created from over 3,000 handwritten registers currently held at the Kent History and Library Centre in Maidstone. These registers have been scanned and digitised in full colour to ensure the highest possible image quality. Today’s release builds on an existing partnership between Findmypast and archives in Kent that has already resulted in the online publication of over 2.5 million Canterbury Archdeaconry records held by the Canterbury Cathedral Archives. · Kent Baptisms - Discover when and where the baptism took place, as well as your ancestor's parents' names, professions, and residence. · Kent Marriages & Banns - These records may reveal when and where your relative's banns were read, as well as who announced them. These records may also reveal when and where your ancestor married, as well as the bride and groom's full names and names of their fathers. · Kent Burials - These records may reveal where and when they were buried, as well as their spouses' and fathers' names. Explore this vast index covering a vast range of Genealogical information on Ontario families. Established by Ontario Genealogical Society volunteers in 1997, this powerful resource currently contains over 2.6 million records and will prove invaluable to anyone looking to trace their Ontario roots. Records from Central America’s largest and most populous country have been added to our growing collection of international records. Nicaragua Civil Registration 1809-2011 contains over 2.2 million transcripts of birth, marriage and death records spanning more than two centuries of the Republics history. 52 Ancestors - Week 272: #445 Melatiah (Hamant) Metcalf (1704-1751) of Medfield, Mass. and Keene, N.H.
Melatiah (Hamant) Metcalf (1714-1751) is #445 on my Ahnentafel List, my 6th great-grandmother, who married #444 Michael Metcalf (1706-1771) in 1728 in Medway, Norfolk County, Massachusetts. * their son #222 Burgess Metcalf (1741-1816), married #223 Jerusha --?-- (1750-1817), in 1770. * their daughter, #111 Mary Metcalf (1780-1855), married #110 Amos Underhill (1772-1865), in 1801. * their daughter, #55, Mary Ann Underhill (1815-1882) in 1839. married #54 Samuel Vaux (1816-1880) in 1839. Melatiah Hamant was born 26 May 1704 in Medfield, Massachusetts, the third child and first daughter of Timothy and Melatiah (Clark) Hamant. * Oliver Metcalf (1729-1797), who married Sarah Hammond (1727-1813) in 1759. * Michael Metcalf (1730-1777), married Sarah Allen (1732-1756) in 1753. * Melatiah Metcalf (1732-1766), married Jonah French (1728-1764) in 1750. * Abijah Metcalf (1735-2825), married Mercy Ellis (1742-1818) in about 1763. * Sarah Metcalf (1737-1812), married Amos Davis (1732-1794) in 1757. * Burgess Metcalf (1741-1816), married Jerusha --?-- (about 1750-1817) before 1770. All but the last child were born in Medway; Silas was born in Rutland, Massachusetts. Michael and Melatiah (Hamant) Metcalf moved their family to Keene, New Hampshire before 1750. Several of their children were married in Cheshire County, New Hampshire. Melatiah (Hamant) Metcalf died on 30 December 1751 in Keene[3-4]. There are no known burial or probate records for Melatiah (Hamant) Metcalf in Cheshire County. 1. Massachusetts, Town and Vital Records, 1620-1988, indexed database and digital image, Ancestry.com (https://www.ancestry.com), "Medway Births, Marriages and Deaths," image 133 of 1171, Michael Metcalf and Melatiah Hamant marriage entry. 2. Vital Records of Medfield, Massachusetts to the Year 1850 (Boston, Mass. : New England Historic Genealogical Society, 1903), page 56, Militia Hamant entry. 3. "New Hampshire Death Records, 1654-1947," digital image, FamilySearch International (http://FamilySearch.org), 2010. citing New Hampshire Bureau of Vital Records and Health Statistics. “Death certificates, 1901-1937", Melatiah Metcalf (1705-1751) entry. 4. "New Hampshire, Death and Disinterment Records, 1754-1947," indexed database and digital images, Ancestry.com (http://www.ancestry.com), Deaths > Index to deaths, early to 1900 > Morse - Nichols, image 2529 of 4992, Melatiah Metcalf entry. 5. Vital records of Medway, Massachusetts, to the year 1850 (Boston, Mass. : New England Historic Genealogical Society, 1905), Marriages, page 232, Michael Metcalf and Miletiah Hamant entry.